There are a number of craft books created with a specific reader in mind, notably Willow Polson’s Witch Crafts and The Crafty Witch. 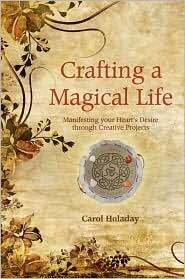 Carol Holaday’s Crafting A Magical Life steps outside of the Pagan framework and attempts to appeal to the larger New Age market. In many ways, it’s a wise decision. Based on the idea that we each have the ability to co-create the life we want, by using specific techniques to unlock our creative potential and use intent to manifest our heart’s desire. Holaday shows the reader how to design and construct 20 projects, including a manifesting map, wand, dream pillow, gemstone amulet, pendulum, prayer beads, power talismans, runes, travel altar, goddess doll, and candles. The book includes correspondences – color, astrological information, moon phase data, etc. Overall, I think this is a great book for learning to make these projects. Her explanations are clear and there are enough pictures that the reader feels like s/he knows what it’s supposed to look like at specific stages. Holaday earns extra kudos for being specific about not using items that are illegal – like feathers from specific birds, even if found.